Ourika is a delightful tale set in France during the French Revolution. George Gordon Byron (1788–1824), commonly known simply as Lord Byron, was an English poet and a leading figure in the Romantic movement. 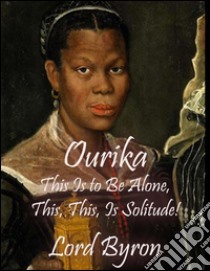 Ourika, was published in 1823, de Duras' novel represents a number of firsts: the first novel set in Europe to have a black heroine; the first French literary work narrated by a black female; and the first serious attempt by a white author to express the feelings of a black character. The story is based on a true account of a Senegalese girl rescued from slavery and raised by an aristocratic French family.